Mud squished between my toes as I stepped into the Rio Grande. I let my weight shift slowly, feeling the bottom with my feet, unsure what I might find beneath the muddy water. The river swirled and churned across fifty feet from bank to bank, its bottom a hidden maze of sandbars and washed out holes. I leaned into the current, prodding forward with my hiking sticks, searching like a blind man, building a map of the bottom in my mind. Sometimes, my legs sunk deep, sometimes not. I moved forward, step by step, as the brown water rose up to my hips and stomach. A wrong step, and I sunk deeper, the water at my chest, pressing into me, knocking me back. My feet squished into the muddy bottom, flailing for a hold. Slipping back, sliding. Then I kicked against nothing, just a deep pool of water and I was swimming, my head just above the surface, the water swirling around me as I drifted down stream. Panic flared in my mind. I spun in the water, flailing for a moment, then caught myself. The words flooded over me and I began to move in the water. The far bank slipped by as I angled toward it. I took a breath of air and calmed myself, kicking and paddling with the hiking poles still in my hands until the ground came underneath my feet again. I stumbled up the bank and stared at my backpack still waiting where I’d begun. I sat on the far bank, soaking in the sunlight, clearing my mind, then crossed back, poking and prodding, missing the deep hole that caught me before, finding a hidden path of sandbars that could keep me upright with a pack over my head. I wrapped half my gear in layers and layers of plastic and left the other half for a third trip. Piece by piece, I crossed again, feeling out the hidden path I’d found, squishing mud through my toes, yanking my backpack high on my shoulders, then on top of my head. I steadied it with one hand as the other felt the way forward. Panic rose with the deepening water, with the push of current on my thighs, then my hips, then my stomach, then my chest. I fought back, piecing steps together, leaning in, trying to find a path underneath the water, testing each step, patient, waiting for the flood of relief that would spill out from the rising bank on the far side. Then I crossed back and did it again. 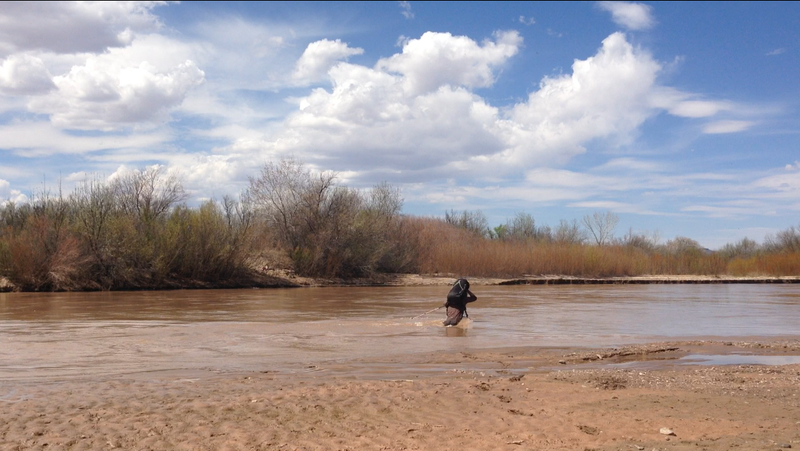 Five times I crossed the Rio Grande, swimming only once, until I had everything on the far bank and lay out in the sun to dry, my body soaked and muddy, my gear safe, and the river behind me. Posted in Grand Enchantment TrailTagged GET, grand enchantment, Rio GrandeBookmark the permalink. That was exciting. Have you ever strapped logs together for a temporary backpack raft rather than carrying for water that deep?